“Confluence” by Bungendore artist Keith Bender sits in the centre of the Gift of Life Garden. Photos: G Jacobs. Celebrations of life marked the opening of three new gardens yesterday at the National Arboretum, completing a suite of seven spaces stretching from the Village Centre to the Margaret Whitlam Pavilion. Encompassing themes ranging from the Gift of Life, Australia’s unique flora, to the joy of childhood, each garden is underpinned by some big ideas about well-being and our national identity. The Garden of Life garden reflects on the process of organ donation where the loss of one life can mean a new chance for another. Balancing the emotions of grief and loss, hope and reflection, the garden was designed by Alex Dalgliesh of Somewhere Landscapes as a quiet sheltered place of curving paths and soft silvery, blue and green plantings beneath a dappled canopy of birch trees. Professor Paul Smith, donor and chair of the John James Foundation, ACT Gift of Life president David O’Leary and Somewhere Landscapes designer Alex Dalgleish in the Gift of Life Garden. 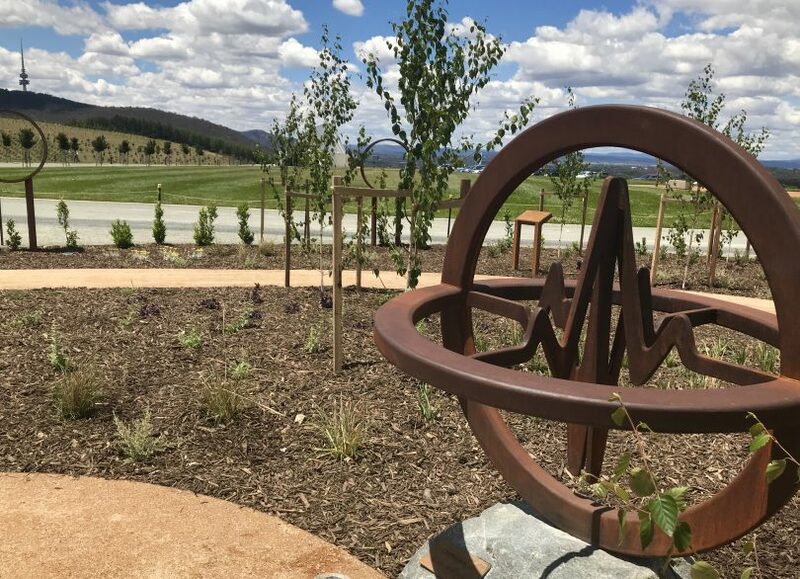 Trickling water, portals opening onto the distant landscape and haiku engravings about the great circle of life are complemented by a commissioned artwork from Bungendore sculptor Keith Bender. Confluence is constructed of corten steel and links two pulses of life together in a circle. The garden was constructed using funds donated by the ACT government, the Federal government, the John James Foundation and several private donors. Speaking about all three new gardens, Federal Minister for Aged Care and for Indigenous Health the Hon. Ken Wyatt, said “If we start with a Children’s Garden we start life with exuberance, we’re immortal, we have fun. Cardiothoracic surgeon Assoc. 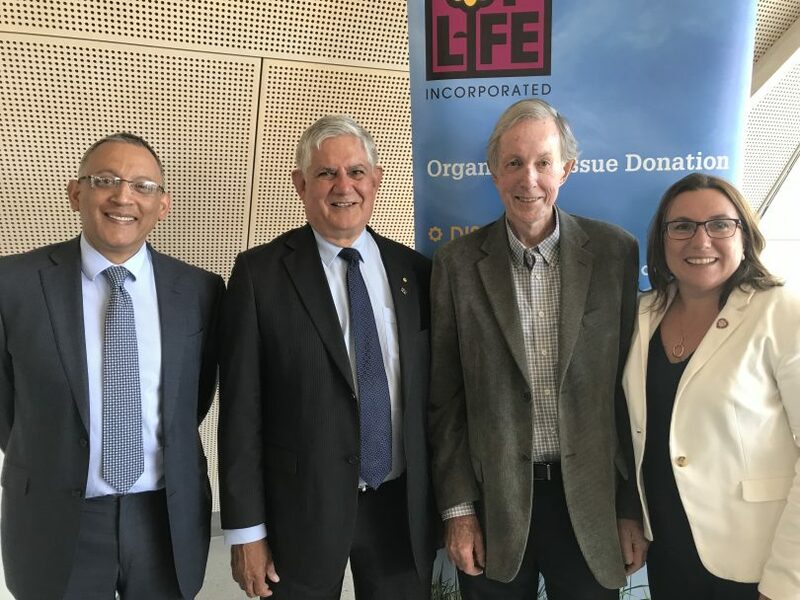 Professor Kumud Dhital, Minister Ken Wyatt, Gift of Life president David O’Leary and Organ and Tissue Authority CEO Lucinda Barry at the gardens launch. Reflecting on the importance of organ donation, Minister Wyatt used personal stories to encourage everyone to sign up to the organ donor register. “I was with one couple who allowed me to sit in on a specialist consultation and look at the liver scans. The wife talked about being confined to the footprint of their mobile phone, terrified a call would come, they might miss it and her husband would die as a result of missing out on an organ. “There were the kids who wrote about their dad being a donor, wondering whether whoever had his heart loved the Wallabies, or took their kids to Saturday sport. The young girl who lost her mum, but said she knew her mother’s heart had made some other little girl and her sister happy.” The Minister also paid tribute to clinicians, medical staff, donor coordinators, advocates and all those involved in the organ donation process. St Vincents’ cardio-thoracic surgeon Kumud Dhital and Gift of Life ACT president David O’Leary both spoke about the need for ongoing community support and philanthropy, and their hope that many who visit the Gift of Life garden will have the donation discussion with their families and sign onto the organ donation register. 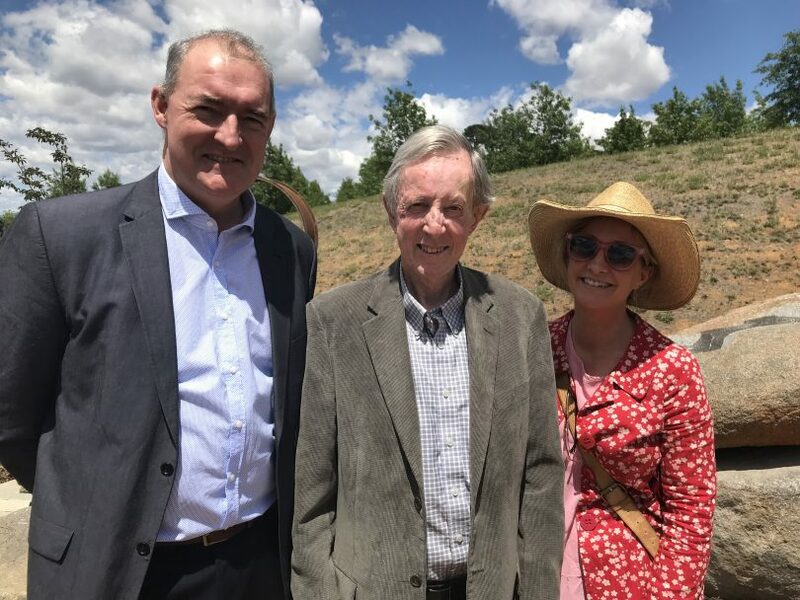 MLA Tara Cheyne, who conducted the official opening of all three gardens on behalf of the ACT government, acknowledged the work carried out by the ACT chapter of the Australian Native Plants Society to build the Terra Australis Garden. This spectacular space features plants from across the continent, set among raised sandstone, winding paths and water features, including two tree species that are over 200 years old, a Macrozamia and a Xanthorrhoea. The Children’s Garden was donated by Brand and Peta Hoff and provides a space for children to play, explore and interact with their environment. With the opportunity to climb, hop and weave through a wiggly worm tunnel, the garden triggers the imagination. The Gallery of Gardens is now open at the National Arboretum. Tulip Top Gardens ends this weekend!